Clannad is an anime that I hear about since I started watching anime in a more constant way. This fact puts my expectations at a high level, which probably affected my opinion of this anime and consequently affected my review.
" 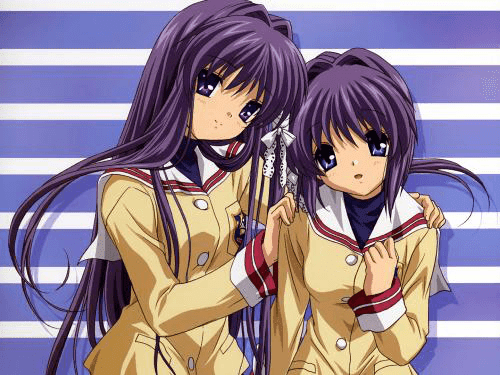 A Simple and Boring Love Story"
Clannad was the first winner of my post “Pick One From The Past”. For this survey I selected three animes from past seasons and asked to vote for the best for me to see and review! 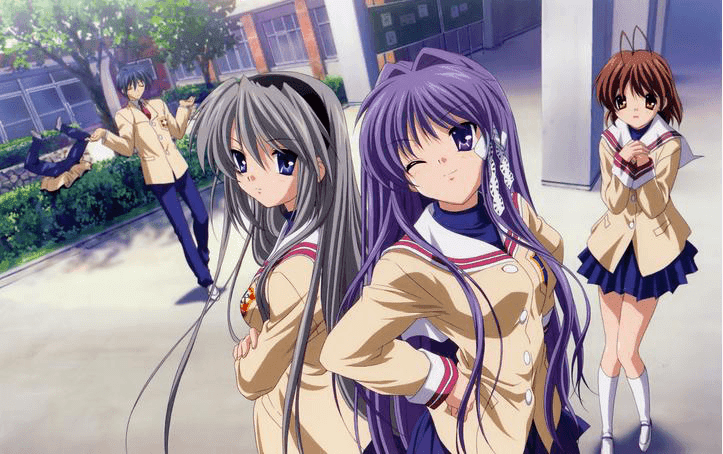 Clannad is a Moe animation love story, in direct competition with K-On and Lucky Start for the title of “Moe King”! Well I screwed up on this, the version I watched had the opening removed and I only understood that in the end! I watched the opening (later) and, although I thinking it's a parade of characters, I realize that efficiently introduces the characters and their names. The naming of the characters is very important in this type of anime because the plot is too centered in the characters itself! 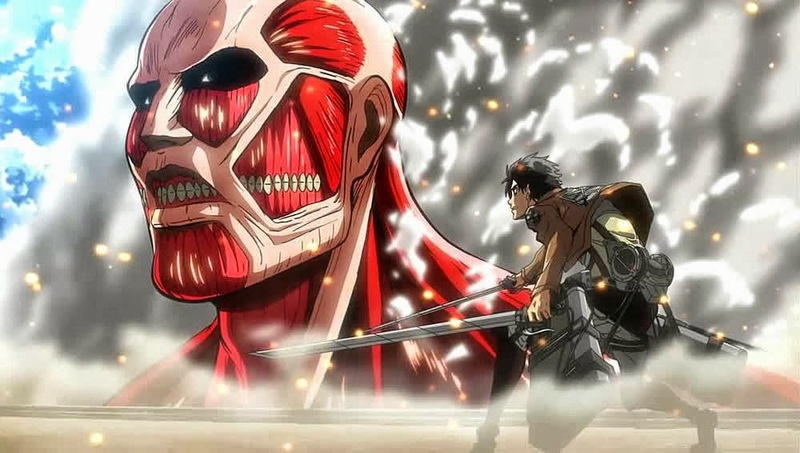 When watching this anime, I had a serial of conditionings! I had high expectations because Clannad is an anime that every anime watcher knows, I rarely see any criticism of it, an anime that makes you cry! I usually cry very easily, just a little emotion it is enough :P and sincerely (with exception of 2 or 3 punctual moments) I got really bored! But in my analysis I will try to give a discount because of the age (aired 2007-2008)! This is an adaptation of a visual novel with the same name, in my opinion this season splits in 4 arcs. Each arc basically makes a presentation of the characters giving air time to the secondary characters although the constant presence of Tomoya and Nagisa. 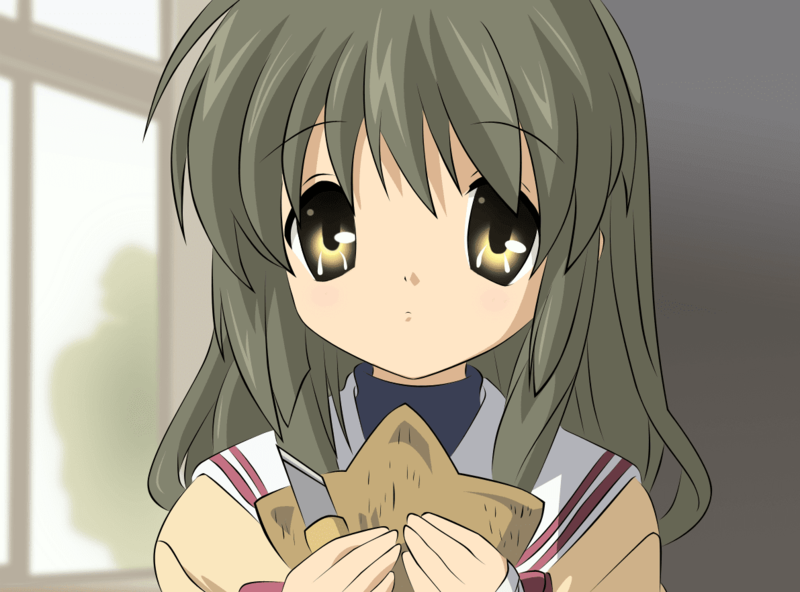 Besides 5 or 6 secundary characters, history is centered in Nagisa and Tomoya from the beginning. The only exception is in the the genious arc (Kotomi) where Tomoya and Kotomi are the only ones to show up. The Ghost arc is the paranormal part of this story and probably the saddest. In this arc we assist to Fuko a first year student, trying to convince people to notice her and to invite them to her sister’s marriage (a former teacher in High School). The first arc is too long for me (even giving a time discount due to the introduction of characters). Basically Tomoya and Nagisa meets Fuko and connect her to a school’s myth of a ghost. So they decide to help her! Their help increased Fuko's reputation and everybody in school acknowledged her existence, except her sister. At this point of the history the climax is reached, so from this point on everybody starts to forget her, including Tomoya and Nagisa (do to the fact of Fuko condition deteriorate). This arc ends with the marriage of Fuko’s sister where she recognizes Fuko’s ghost! 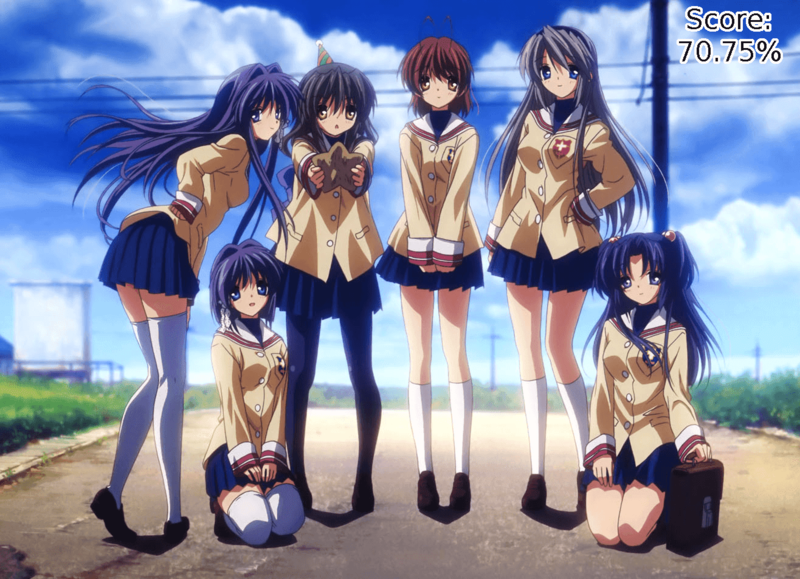 Then Clannad turns into a harem, which bores me a lot. The only exception, I admit, is the fact that Tomoya chooses one of the girls! 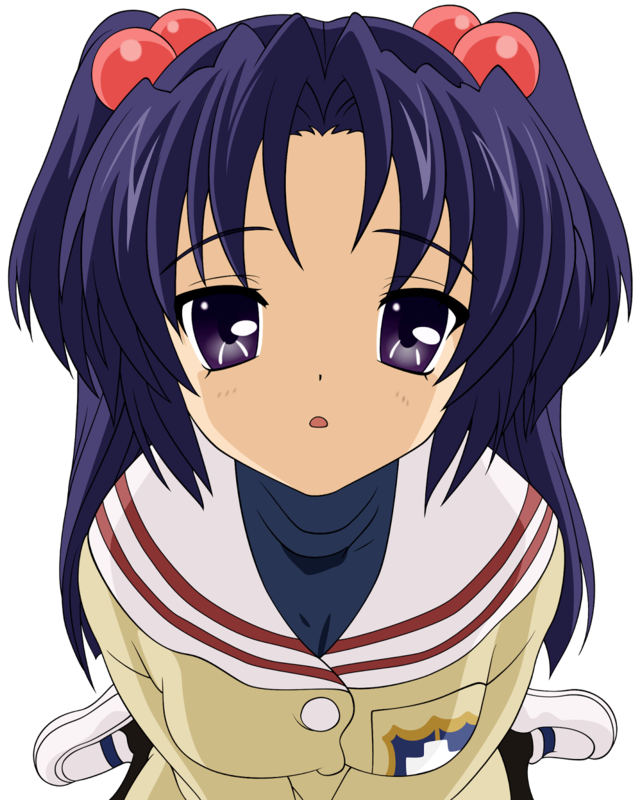 After a very long first arc where we received a slight introduction of each character (except Fuko that almost disappears in a literal form :P), Clannad advanced to present us the school genius Kotomi! Kotomi has some enjoyable moments, like her clumsiness to interact with people. The best of the arc is when she says the sentence that Tomoya taught her with her monotonous voice and not adapted to the situation. Unfortunately this is very little. This arc is centered in a memory plot (I’m not a big fan of this type of plot) where we going to find out that Kotomi holds a terrible past and that Tomoya forgot that he is her unique friend! 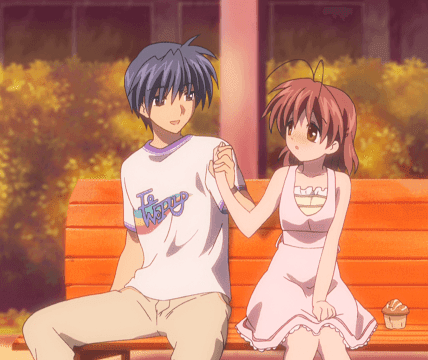 The third arc marks the beginning of the romance between Tomoya and Nagisa. It is here that we are sure that they will stay together. In this arc we learn the story of Tomoyo Sakagami (a girl who knows the arts of kung fu). Nagisa and Tomoya need that Tomoyo be elected president of the student's council in order to help them to reborn the Drama Club! Basically we assist to several events (games) of Sakagami with other sport clubs to show her athletic ability and gain votes to the election (always with the price of if she lose she goes to the winner club). 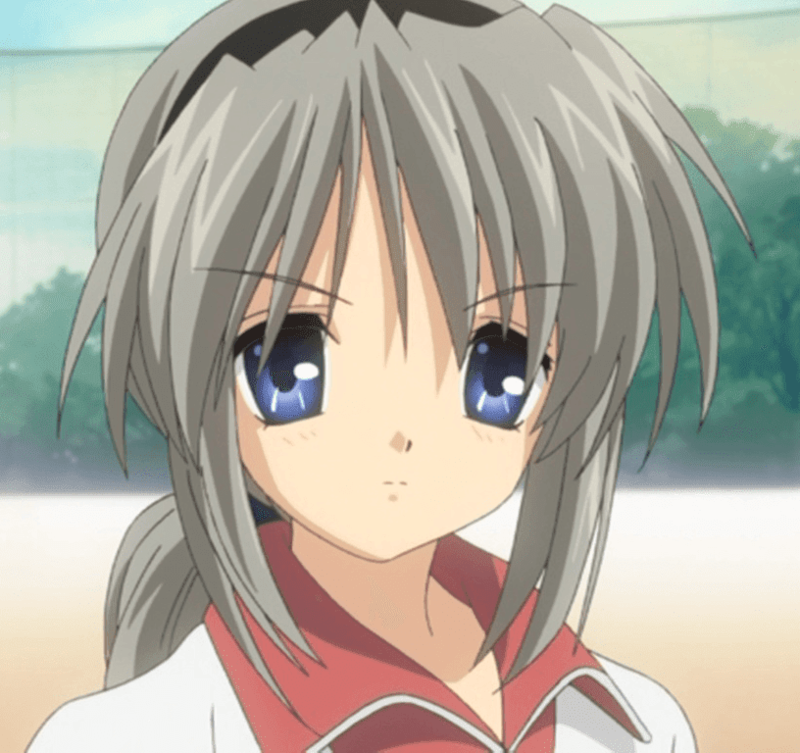 In one of these events (for me this was the better episode) we take sure that Tomoya chooses Nagisa leading to disappointment of the Fujibayashi sisters! In the last arc, on the one hand we see the deterioration of the relationship between Tomoya and his father. And on the other hand the inner battle of Nagisa: fight for her dreams versus the guilt sensation because their parents have abandoned their own dreams to take care of her! The only valid point of this arc is the confirmation of the relationship between Tomoya and Nagisa, instead of annoying and unfortunately very common ends where is left only the feeling that two characters like each other! I need to give a discount because Clannad was aired in 2008. The Clannad's story is the origin and geneses of much anime productions, but I saw nothing special in story that justifies this great love that Clannad has received! Probably I need to watch second season (ClannadAfter Story) to understand this phenomenon, like in Higurashi. In this season I didn’t watch anything phenomenal or innovative! The advantage of making reviews of past animes is that I already know what happened in terms of future seasons. This season in particular is overrated, perhaps the second season is better. I saw nothing special!